Boudin is a type of sausage native to France. 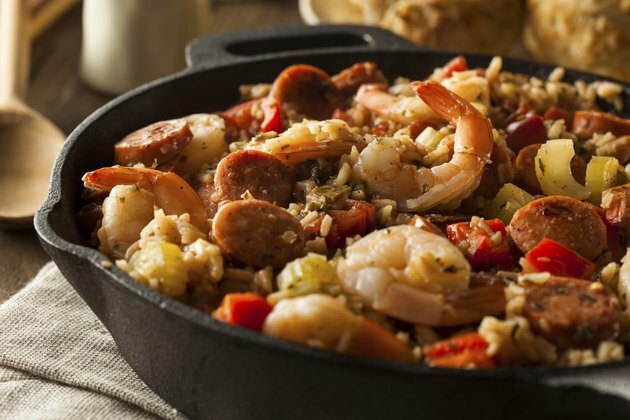 The dish became popular in Louisiana and Cajun cuisine after being introduced by the French. There are several varieties of boudin, including boudin noir, a blood sausage; boudin blanc, a white boudin made with pork and rice; boudin balls, which resemble hush puppies and alligator boudin, which is popular in south Louisiana. Cooking boudin is fairly simple, heat being the most important factor. Preheat the oven to 300 to 350 degrees Fahrenheit. Place aluminum foil on the baking pan and spray some cooking spray evenly on the foil. Some spray may also be applied to the surface of the boudin itself, if desired. Place the boudin in the pan and put it in the oven. Cook the boudin for 20 minutes and then turn it using a pair of tongs. Cook for another 20 to 30 minutes on the second side and remove from heat. Boudin can be cooked longer at lower temperatures for a different texture. Higher heat levels may scorch and pop the casing, spilling the contents. A temperature of 350 degrees Fahrenheit or lower will ensure the contents are heated thoroughly and the casing stays intact. 20 to 30 minutes of cooking time on each side will ensure a "snappy" casing and that the boudin has been heated all the way through. Some people like their boudin just lightly cooked and discard the casing, while others prefer to eat the entire sausage, casing and all.